Long has scored five goals in his last 10 matches. LEICESTER DID THE unthinkable and clinched their first top flight title without even kicking a ball on Monday night but the Foxes have still got two fixtures to play and next up is the visit of Everton on Saturday evening. There will no doubt be a party atmosphere at the King Power Stadium and we’ve all seen the images and videos of the Foxes players celebrating this week so you’d be forgiven for thinking that the players may not be 100% committed to winning the game with the league already wrapped up. That said, in Everton they face a club sitting mid-table with nothing to play for so we’re going for a draw with both teams to score before Leicester captain Wes Morgan is handed the trophy at the final whistle. With Aston Villa already dead and buried, Newcastle United travel to Villa Park with the aim of claiming the points that will take them to safety. The Magpies are just one point above the relegation zone but both Sunderland and Norwich have a game in-hand so they’re not out of danger just yet. Villa are on a winless run of 11 games having thrown in the towel long ago and you would expect Rafa Benitez’s side to come away with a victory on Saturday. The two clubs floundering just below Newcastle, Norwich and Sunderland, face tough opponents in Manchester United and Chelsea on Saturday afternoon. 19th-placed Norwich picked up three points in April thanks to a 3-2 win over Newcastle but they’ve lost the last three on the trot since then and United, still chasing fourth, have been decent since the defeat to Tottenham a month ago. Big Sam’s Black Cats, meanwhile, are unbeaten in their last three while Chelsea may not be quite as up for this one as they were in Monday’s heated 2-2 draw with Spurs. 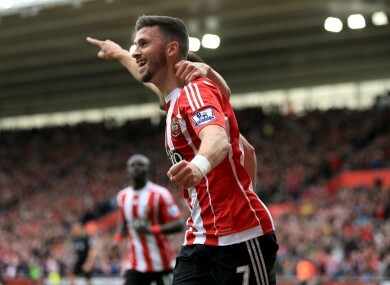 With 13 goals in all competitions for Southampton over the current campaign, Shane Long is enjoying his most prolific season in England’s top flight. The Tipperary striker has three goals and as many assists in his last five games for the Saints and it bodes well for Ireland heading into this summer’s Euro 2016 finals. At lunch-time on Sunday, they’re away to Spurs, who are the only Premier League club left that Ronald Koeman hasn’t beaten, so Long is aiming to put that right. The gaffer said in the last couple of years there’s only two teams we didn’t beat – Man City was one and Tottenham was the other, so that’s one hurdle over,” he told the club’s website. Third-placed Arsenal are away at the Etihad Stadium on Monday night when Man City can draw level with the Gunners with a win. Manuel Pellegrini will have to pick his players up after their chance of reaching this year’s Champions League final was snatched away by Real Madrid on Wednesday night. Arsenal, unbeaten since their European exit at the hands of Barcelona, were 2-1 winners when these two met earlier in the season and we’re predicting a similar result. Email “Long to strike against Spurs and the Premier League bets to consider this weekend ”. Feedback on “Long to strike against Spurs and the Premier League bets to consider this weekend ”.